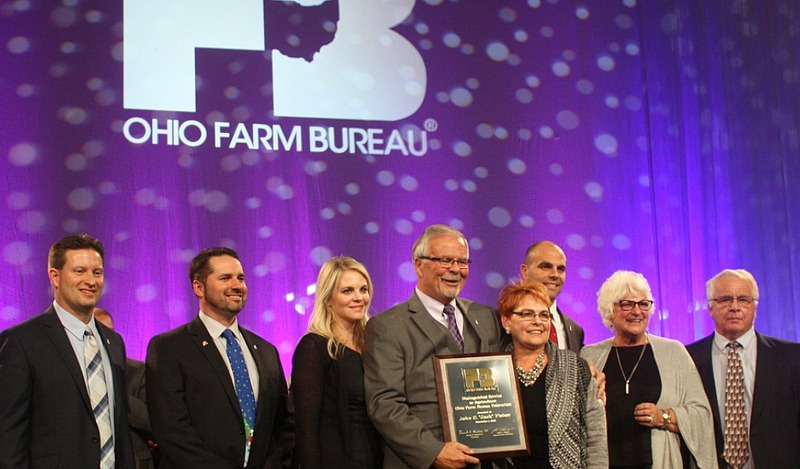 COLUMBUS — The Ohio Farm Bureau Federation presented only one distinguished service award this year, focusing the spotlight on an individual who guided the organization for 20 years. Retired Ohio Farm Bureau Federation Executive Vice President Jack Fisher received the farm group’s Distinguished Service to Agriculture Award Dec. 1. 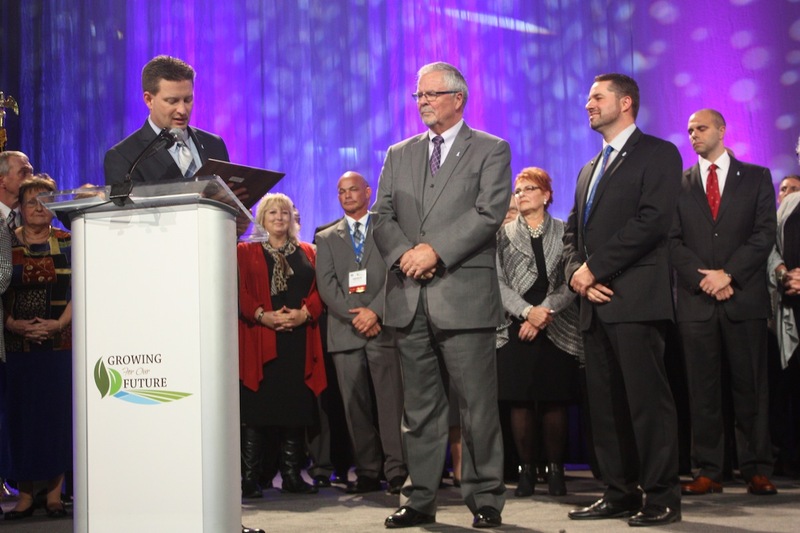 The honor was presented during the farm group’s annual meeting, which was held Dec. 1-2 in Columbus. Fisher, who was named to the OFBF’s top post in 1996, retired in July. Farm Bureau members who served on the state board during his tenure filed on the stage and stood in the background as Fisher was honored. By his own count, he’s worked with eight state presidents, more than 500 county Farm Bureau presidents, and thousands of local volunteers. Ohio Farm Bureau Executive Secretary Adam Sharp (left) presents his predecessor Jack Fisher with the farm group’s Distinguished Service Award. Presenting the award was Fisher’s successor, Adam Sharp, who has been around Ohio Farm Bureau members ever since his parents took him as a child to local advisory council meetings. Sharp was one of the individuals Fisher mentioned in his thank-you remarks. Before joining the Ohio Farm Bureau, Fisher served as assistant director of the Ohio Department of Agriculture, director of the Illinois Corn Growers Association and Marketing Board, and executive director of governmental affairs and commodities for Illinois Farm Bureau. He is a former member of the board of trustees at The Ohio State University. He serves on the board of trustees for the Columbus 2020 Economic Development Board, and is co-chair of Ohio State’s College of Food, Agricultural and Environmental Sciences Fundraising Campaign Planning and Fundraising Organization. He has served on the board of trustees for BioOhio and the board of directors for Children’s Hunger Alliance. He has been inducted in the Ohio Agricultural Hall of Fame, OSU Department of Animal Sciences Hall of Fame, the Ohio State Fair Hall of Fame and received the OSU College of Food, Agricultural and Environmental Sciences Distinguished Service Award and the College’s Meritorious Service to Students award. 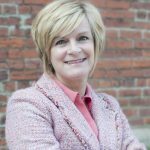 Fisher grew up on a farm in Crawford County, Ohio, and holds bachelor’s and master’s degrees in agriculture from The Ohio State University and a master’s degree in counseling from Ball State University. He served in the United States Air Force. He and his wife, Judy, are the parents of three children and have seven grandchildren. Also during the convention, the Ohio Farm Bureau Foundation announced it has received leadership gifts to The Fisher Fund for Lifelong Learning, honoring Fisher’s contributions, including $1 million from Nationwide, $300,000 from Ohio Farm Bureau, $25,000 from current Farm Bureau state board members and $250,000 from Farm Credit Mid-America. The Fisher Fund will invest in teaching students about food, agriculture and nutrition, developing agriculture youth by providing constructive and encouraging relationships between them and their peers and adults, strengthening beginning farmers’ technical and business skills and providing learning opportunities for adults.